Skeletons and skulls are not scary; it's a celebration of life. in many parts of Mexico on November 1st and 2nd. Less like Halloween and more like Memorial Day, Day of the Dead is a time when families remember loved ones who have died. 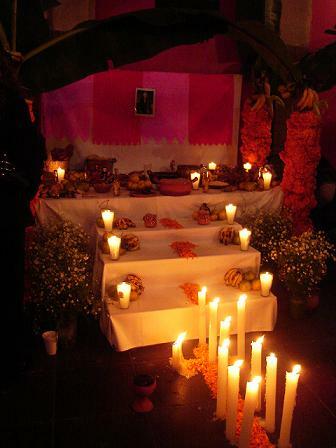 people honor their deceased relatives with altars, special offerings and prayer. 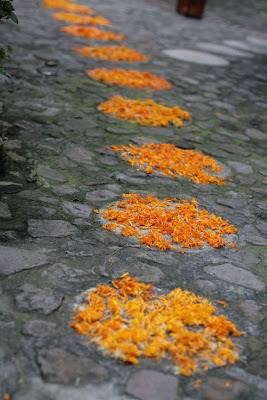 "home" with a trail of marigold flowers. 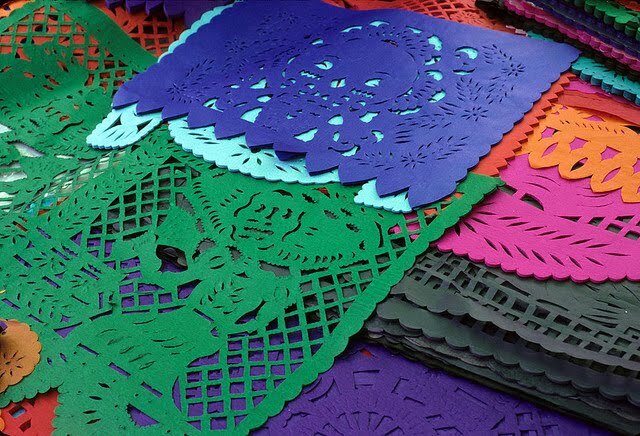 is tissue paper that has been cut using chisels and special designs. 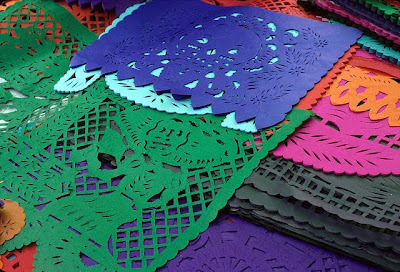 Sometimes up to 40 banners are carefully cut at once! Paper Mache figures imitate real life and are funny and satirical. 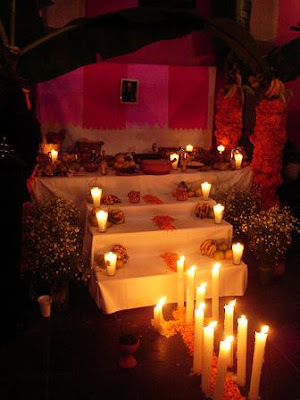 Altars and arches are prepared for loved ones who have died. 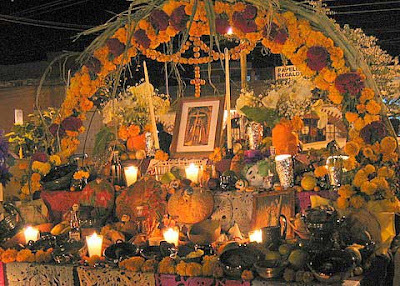 Candles, flowers, and food are some of the most typical decorations found on an altar. 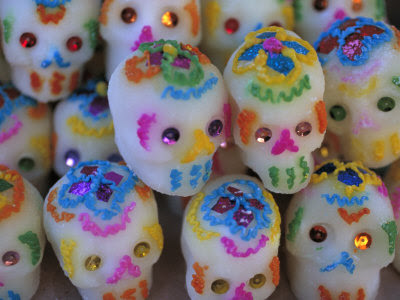 How would you like to receive one of these dazzling hand decorated sugar skulls as a gift? Many bakeries will personalize the skull with the name of your choice while you wait. 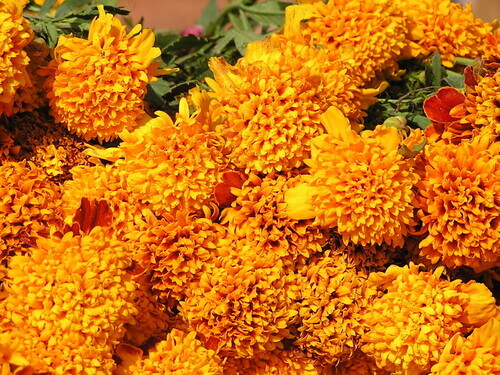 called cempachucil, used to decorate altars and arches. Pan de Muertos, bread of the dead. 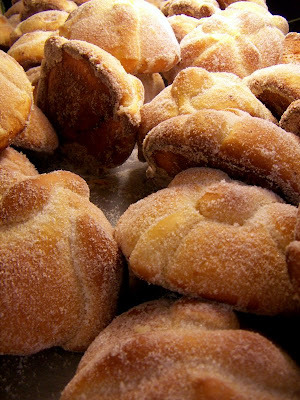 The sweet, doughy bread is only made during this time of the year. What beautiful photographs! 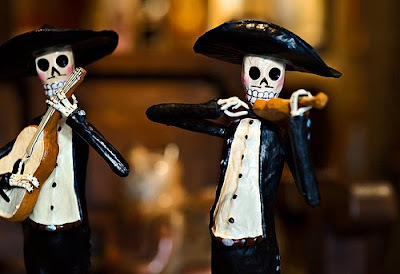 Love the whimsical skeletal musicians! Thanks for sharing the culture of the beautiful part of Mexico!